Patricia Locke jewelry is a distinct, modern jewelry collection. You’ll find fabulous combinations of color, as well as a pleasing palette of neutral shades. Each design reflects the designer’s unique style of combining geometric shapes & color and mixing various metals. 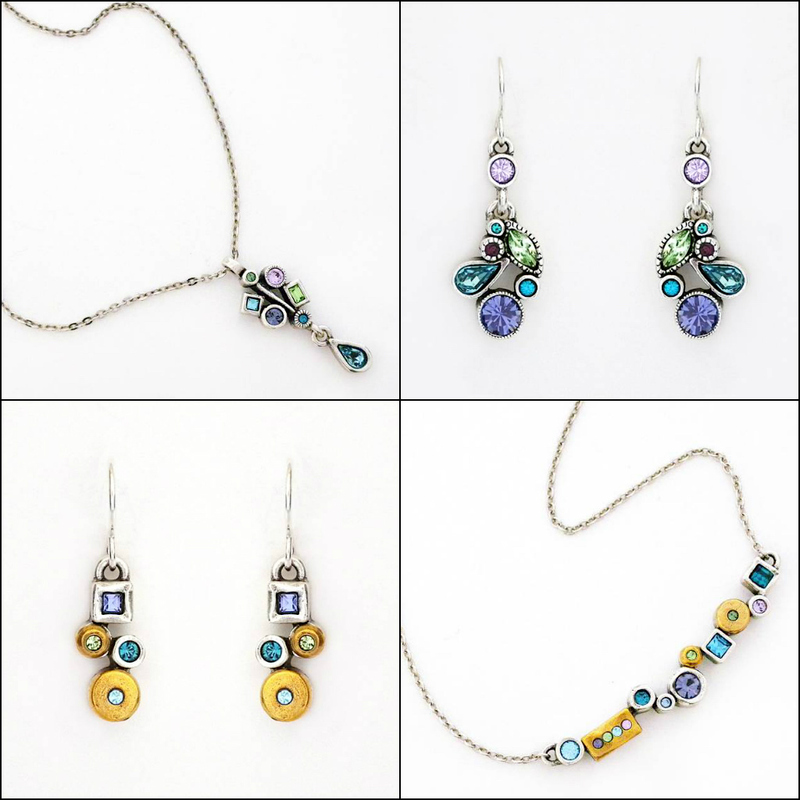 You’ll find a range of designs from dainty earrings to statement necklaces, that can be worn casually, for a night out on the town or to formal parties. 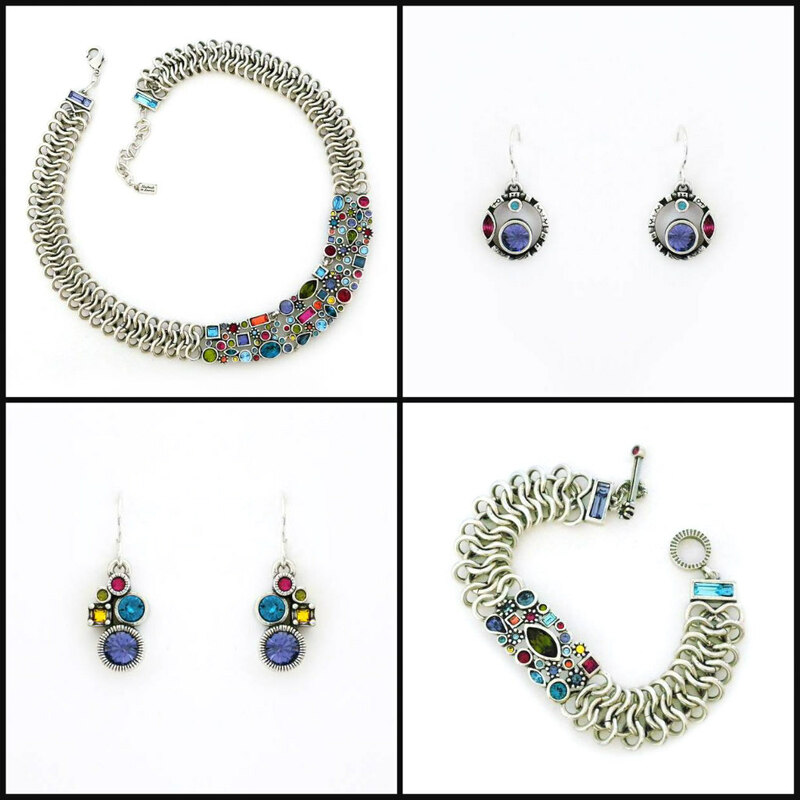 Each piece of jewelry is immediately recognizable and reflects Patricia Locke’s unique style. All of Patricia Locke jewelry is created with crystals & semi-precious stones and is set in sterling silver or 24kt gold plating. Each piece is hand-made in the USA, therefore, if you see a piece you love and want it in a different metal color, need a bracelet or necklace in a shorter or longer length, it is doable! and can be ordered for you as a custom order. Just let us know what you need. Our favorite collection: Black & White. Deco inspired jewelry set in silver with sparkling clear, black diamond and jet crystals. Neutrals that dress up or down for any occasion. Shown: Confetti Statement Necklace, Montage Pendant, Park Ave Drop Earrings & the ever popular Pixel Studs. The Waterlily Collection. Yes, as stunning and relaxing as Monet’s infamous painting. Beautiful pastel crystals are set in silver and designed in geometric shapes in Patricia Locke’s modern style. Shown: Crackle Pendant, Danae Necklace, Cherish & Ria Drop Earrings. Celebration Collection. This is the first collection we introduced. The burst of jewel tone colors immediately caught our eye and inspired us to meet the designer. Find a variety of modern designs in geometric shapes that resemble modern art. Two more neutral stories that we love. Champagne & Crystal Pearl. These two Patricia Locke Collections interpret classic evening wear jewelry with a modern, chic attitude. Shown: Curtain Call Necklace and Splash Earrings in Crystal Pearl and Falling Star Earrings and Sparkle Necklace in Champagne. Patricia Locke Zephyr Collection. A stunning array of jewel tone crystals set in 24Kt gold plating. Geometric shapes with an industrial chic vibe. A great way to add a splash of color to your wardrobe as well as a bit of edgy attitude. Shown: Danae Necklace, Ria, Girlfriends and Dancer Drop Earrings. Statement Bracelets. The Confetti band bracelet is one of our post popular. 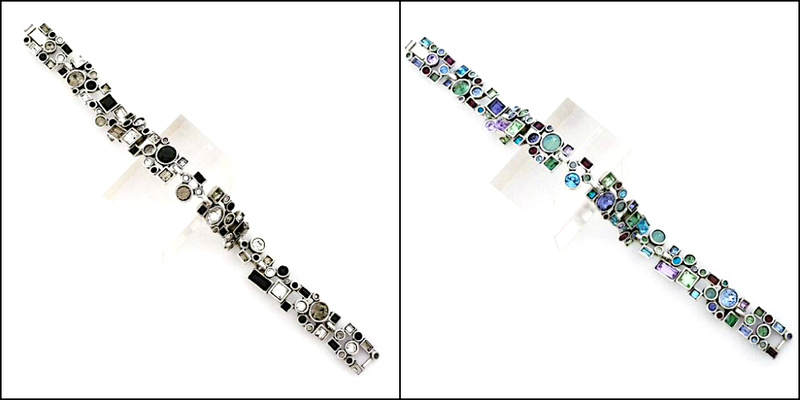 Whether going for a black and white deco or look or a burst of color, it’s definitely wrist-candy that catches one’s eye. We’re excited to now be offering Patricia Locke as part of our fashion jewelry collections. The collection offers a lot of variety, so whether you’re looking to spice up your office attire, want an everyday go to piece, or have a party or formal affair to attend, your bound to find a piece of jewelry you’ll love or that will make a fabulous gift.